The Rutaceae family has a number of highly ornamental genera like Boronia, Correa and Eriostemon to name but a few. 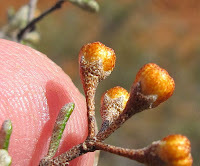 The foliage often has large oil glands that can produce a pleasant refreshing odor, which is a distinctive feature of many plants within this family. 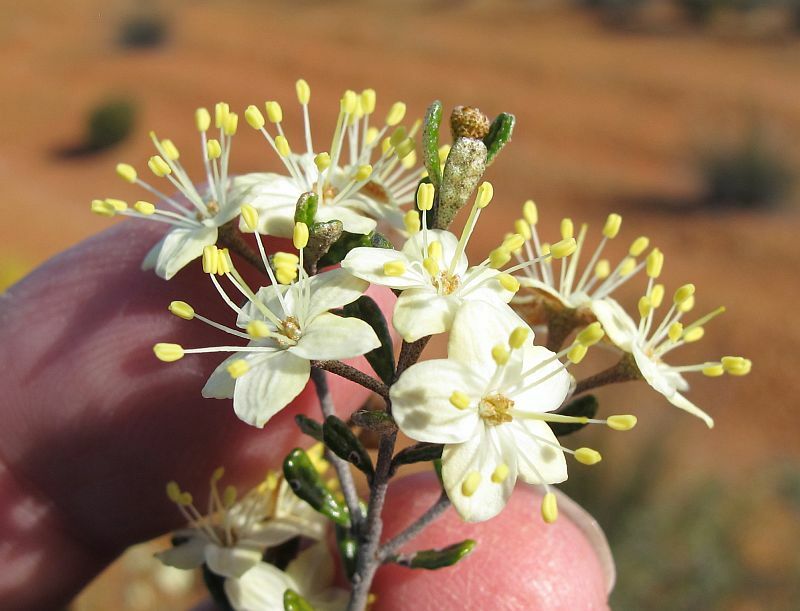 When these plants were first discovered, the prominent oil glands and short lobed calyx initially suggested they belonged to the Myrtaceae family where these characteristics are also common. 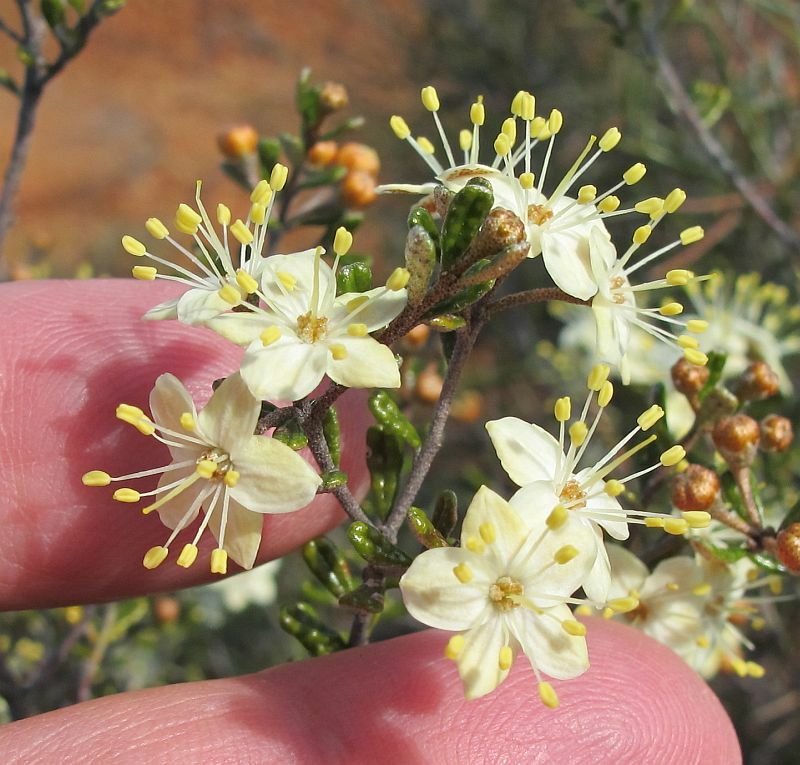 There are around 30 Phebalium species, which are endemic to Australia and range from the lower half of WA to SA, Victoria, NSW and extending to north Queensland, plus there is even a record from NE Tasmania. They tend to prefer the drier districts, so most are usually rare to non-existent in well-watered regions. 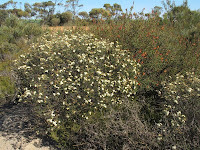 In the mallee habitat inland from Esperance, there are several species most of which are commonly spread through the area. 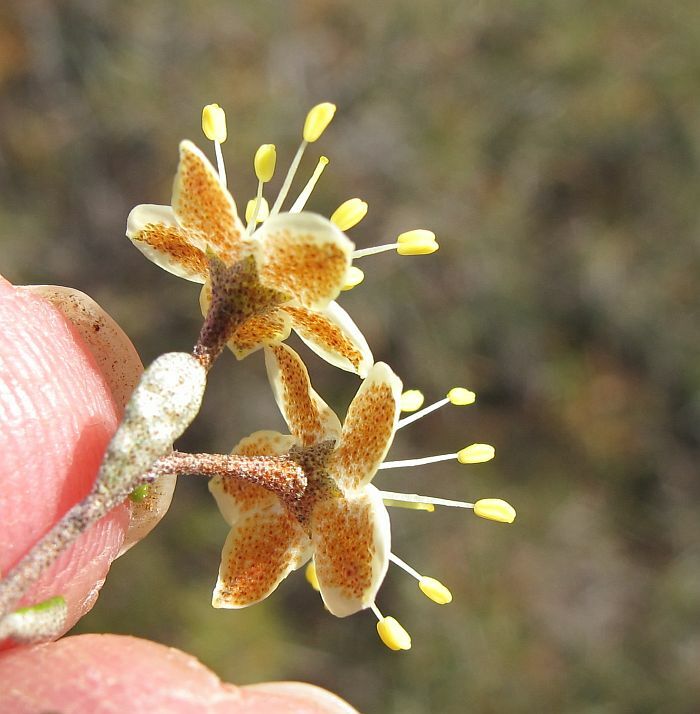 They are highly distinctive plants and unlikely to be confused with non-Phebalium taxa, but they can be very difficult to identify between species. The problem arises from the common habit of two or more species growing together. 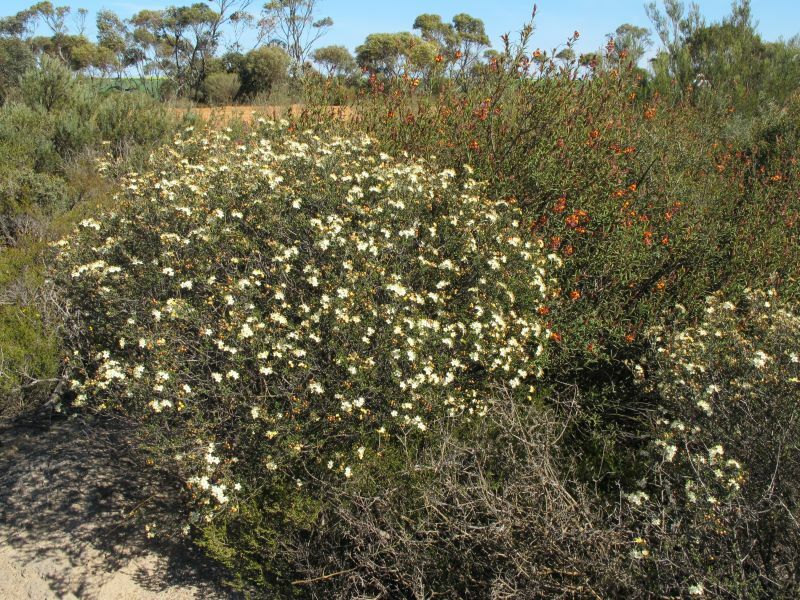 This in turn leads to many naturally occurring hybrids that can keep you guessing about their identity, unless a number of plants have been sampled for comparison. Phebalium flowers play a relatively minor role regarding identification, as apart from color and calyx length they are not especially distinctive. However in WA, the foliage is more important and how most species are most readily identified. Foliage length is important, likewise if they are recurved or not, plus if the top of the leaves are channelled (grooved) or not. It can be very difficult to identify only one or two plants, but when a number of dried specimens are compared the leaf shape and size become more obvious, making any plant with an odd leaf size and/or shape probably a hybrid. 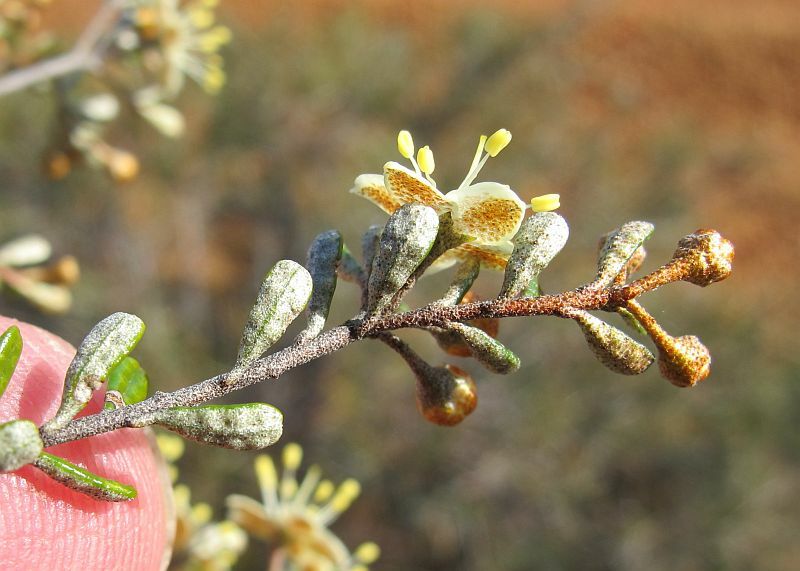 Phebalium megaphyllum is one of the species with a single grove on the upper leaf surface, which forms a thin central keel (nerve) below. 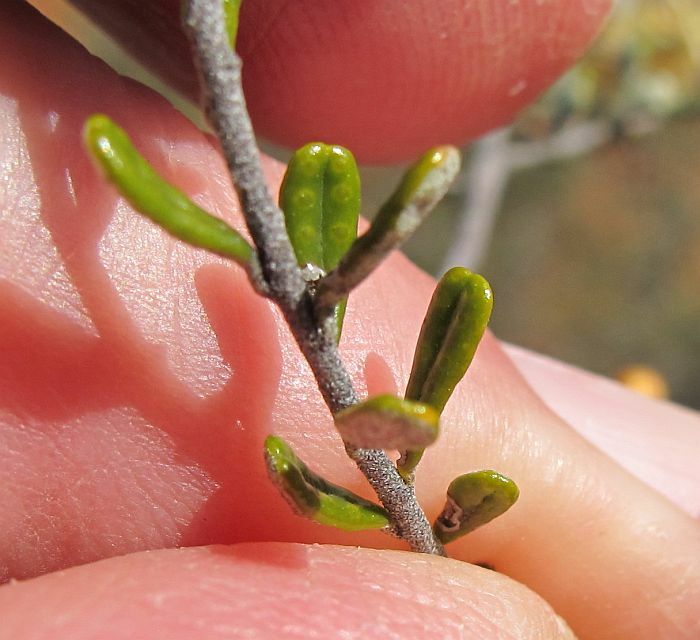 The stems are also verrucose (warty), although on my specimens they are relatively small and not pronounced. 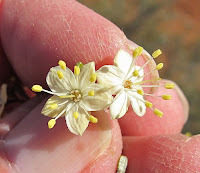 The flowers are noticeably yellow, or at least a rich cream and the species favours sandy loams over gravel where it can grow to 2 metres (over 6’), but locally are usually closer to 1 metre. 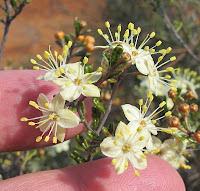 It is quite a common shrub to the NW of Esperance in the Cascades Road area, especially to the north of Rollonds Road, although I have also collected it from the Kau Rock region 70 km NE of Esperance. This large jump in distribution may be related to the mostly limestone substrate between these areas, with the preferred linking gravel substrates further south but having been cleared for agriculture. Phebalium megaphyllum along with Phebalium tuberculosum a white flowering species and without a grove in the leaves, both flower from the end of July to September. However although both species are common in the NW district, I have not seen mixed colonies.